MOVIES ON THE MEADOWS IS BACK! 12 FILMS, 4 NIGHTS, 1 RIVER, MILLIONS OF STARS! Sunset screenings on the August Bank Holiday weekend. For the 11th year the Cambridge Film Festival is bringing the much loved annual "Movies on the Meadows" summer film screenings to Grantchester. Over the August Bank Holiday weekend, the 11th edition of Movies on the Meadows will bring 12 films, over 4 nights to the beautiful and picturesque setting of Grantchester river meadows. Bring your own picnic or browse the varied food and drink on offer from the very best local vendors, before snuggling on a rug under the stars to watch the evening feature on our giant inflatable Airscreens - some of the largest in the UK! We will announce the full lineup of Movies on the Meadows very soon and we promise there will be just as many great films as there is every year! TBC - Stay tuned for full lineup! Early Bird discounts are available for anybody purchasing a Movies on the Meadows ticket before the end of June. 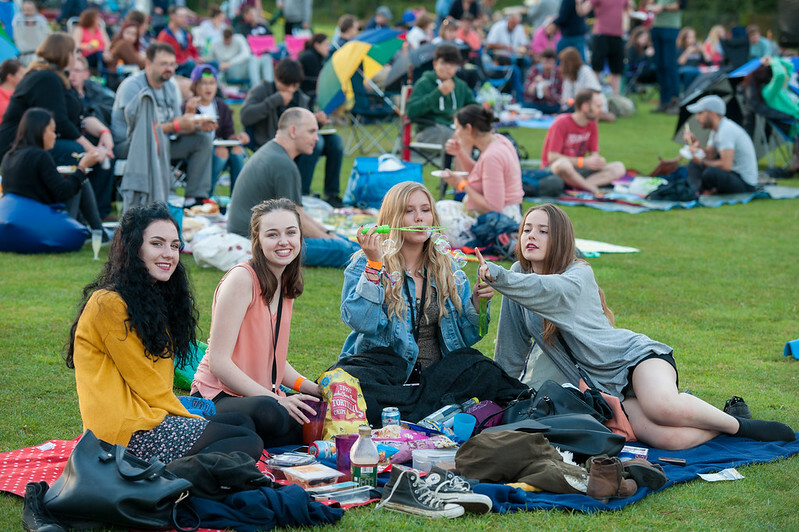 Movies on the Meadows is presented by non profit organisation (registered charity) Cambridge Film Trust, to help raise funds for the annual Cambridge Film Festival. For all the VERY LATEST ANNOUNCEMENTS! Sign up to the Facebook Event. Join the Festival mailing list. The box office will open at 6pm. You are of course very welcome to come and enjoy the site before the box office opens. Films start just after 8pm (approximately, dependent on nightfall). Films Finish by 10.30pm (approximately). Grantchester Meadows, Spring Lane Field in Grantchester, near the Orchard Tea Gardens. The main access will be off Mill Way and will be signposted. There is strictly disabled parking only on Spring Lane Field itself. A free car park for all other patrons will be available further down Mill Way (towards Trumpington). This will be clearly signposted and stewarded. We suggest that people local to Grantchester cycle, walk, or punt! We advise purchasing tickets in advance via www.camfilmfest.com/grantchester however there will be a cash box office on site where tickets can be purchased from 6pm on the day of the event. There are no card facilities or cash points on site. Those who have pre-booked tickets will need to bring a copy of the confirmation email (whether printed or on a smartphone) and any concessions/discount card. Movies on the Meadows is a ‘silent disco’ screening so each customer will be provided with a 3 channel pre tuned radio. Please note you will need a returnable £5 cash deposit per radio. We suggest that you bring your own (3.5mm jack) headphones as these will be the most comfortable. Each night all three films will show simultaneously on three separate screens. This enables attendees to choose any of the three films, without their whole party having to choose the same film. There will be catering on site from a selection of local street food vendors. You are also welcome to bring their own food and drink. No BBQs allowed. There are no seats provided so please bring your own camping chairs or blankets. The venue is accessible for disabled patrons, despite being on slightly bumpy ground, and disabled patrons can park close to the event entrance. Dogs will be allowed so long as they do not cause disruption to the event. The events will go ahead rain or shine, and will only be cancelled if it is not safe for the event to go ahead. Refunds will only be given if the event is cancelled. Cash (for each radio deposit and food vendors. There are no cash facilities on site). Blankets or camping chairs to sit on. Why not volunteer at one or more of the nights of Movies on the Meadows for a behind the scenes view of this event? More information can be found on our volunteering page.